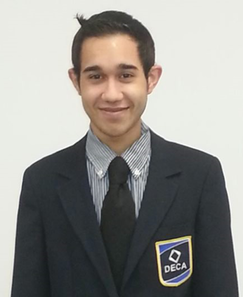 Zach Schaja wrote a great article on DECA Direct about competition. He says “it’s not necessarily the smartest members who qualify for ICDC, but it’s always the hardest workers.” This is something that must be understood. As long as you work hard to win the first place trophy at CDC you will have a great shot. Being prepared gives you the most possibility of you winning that great and cherished first place trophy at CDC, and getting you on your way to competing at ICDC. Zach also says that whether it is “perfecting your presentation, practicing role-plays, or dominating as many practice tests as you can possibly find, hard work pays off when it comes to ICDC.” So get studying, download the DECA Competitive app on the Google Play Store or Apple App Store and do as many practice exams as you can. Find sample role plays and practice those. Finalize your project sooner rather than later so you can get in as much practice so your presentation can be perfect at CDC. Good luck to everyone competing at CDC! CDC is coming up quick and that means three things! 1: SCHOLARSHIPS! Florida DECA gives away scholarships to our members. This is our way of giving back to our amazing members, and reminded you that You Are DECA! We do this through the Dollars for Scholars fund and from the donations of our amazing sponsors. You can find these on the Florida DECA website very soon. I encourage you to all sign up. Don’t worry about what if you are not selected, take risks and you will be greatly rewarded! Please remember, you must be a high school senior during the 2014-2015 school year to be eligible. 2: Networking! During CDC you will be getting student from all around the Sunshine State. Be sure you take advantage of this new opportunity, networking is one of the most beneficial things DECA gives to you. Network with the judges and corporate representatives that are there as well. The more professionals you meet the better, they could even give you a job in the future (they are bosses!). When you attend CDC have fun and meet new people! 3: Competition! This is the initial reason you are going to CDC, might as well make the most of it! Imagine hearing your name called to stage. The members from your chapter cheering, and you are the spotlight. Hard work pays off. You have made it this far you might as well give it your all one more time and make it to ICDC! You have what it takes to do it. As long as you put your mind to it you will do great. Do your best, study hard, practice as much as possible and be confident. CDC is March 5th, less than two month away. It’s about time to get hyped! I Am DECA means we are all one and we are all striving for the same goals. The first goal is to learn. Competition is one the biggest ways we learn from DECA. With testing we learn all there is to know about marketing, finance, hospitality and management. With role plays we get to put what we have learned and apply it to a real world situation. Take all of these experiences and keep them with you so that you have put all of these into good use. A majority of us DECA members are very competitive. It is why we are in DECA, to showcase our skills and show them off. Nothing is better than seeing all the hard work you put into something pay off with a reward. Even if you don’t win, competing by itself is a huge accomplishment. Think about all of those members who don't want to compete and all of the people in your school who are afraid of competing. Competition is a huge lesson learned because it will give you the confidence to do anything such as a job interview. Finally, networking is a huge part of DECA, and that should always be remembered. Outside of competition DECA provides you with the opportunity to meet business professionals from your community. This can go a long way in helping you with your future endeavors. Keep all of you contacts you receive from business professionals because you never know when you will be able to use them for good use. Networking is a huge part of the business world, and being exposed to that is a great opportunity. One of the four DECA principals is being community oriented. However it is very difficult being a community oriented chapter. You don't have to be an officer in your chapter in order to organize a community service project! Following these steps will help you and your chapter become community oriented. The most difficult step is getting started. The best way to find a local charity to help is first finding what you are passionate about. Whether that is helping the homeless, helping disabled veterans, anything you are passionate about you can find a charity for it. Once you have what you want to do then find a charity that helps what you are passionate about. Contact that charity and ask what would help them the most. Once you get the difficult part done, its time for the fun part! Organizing the event within your chapter can be stressful, but it can also be a lot of fun. The best way to organize the event is delegating certain tasks to different people. Making sure the roles you give to people is the right role for them is a vital part for the success of this event. I recommend piking roles with your advisor. Even though you are picking roles for people, make sure those people have a team to help them so they are not doing one responsibility by themselves. For example, have one person in charge of marketing and promoting and make sure they pick the right team to help them market and promote the event to your chapter and school (if you want to make it a school-wide project). This will also be helpful in making sure in case one person can’t do something, you have a backup plan! Wanting your chapter to be community oriented is great, but it can be very difficult promoting why being community oriented is important to many of your members. Show your members why this is going to benefit them. Also tell your members why we are helping that charity. Knowing the mission statement of the charity you are helping is the best way to get that across. Their mission is what drove you to help them, it will make your members want to help them as well! When the event is over, don't just think “we did it, great!” Show off your accomplishment! Tell your administrators in your school, let it known on the announcements! Make sure students in your school know that DECA is involved in your community and that your chapter gives back. Publicizing an accomplishment is great, and could make students want to join DECA! How to set up: The very first thing you should do is contact a local charity to set up a time and date that you and your members can go to that charity and volunteer your time. Make sure it is a date and time that you, one or all of your advisors, and your members can attend to make the greatest impact! How to promote: SPREAD THE WORD! You don’t have to limit this to only your chapter. Tell everyone around your school. Hang posters, announce it on your announcements; make this a huge deal in your school! When you do this you will not only raise awareness of what DECA is within your school, but you will also gain interest of students to join DECA in the future! How to execute: With a well-planned and well promoted community service project your event will be a success. But you can’t stop there. Make the charity a big partner with you and your chapter, if it is not already. Make sure those who participate from your chapter put in the most effort in trying to make the event a success. You want to make the charity want your chapter to come back for future events. If you follow these steps, your chapter will be on the verge of being fully community oriented and will be well connected with your local community. Also your chapter will gain an increased amount of popularity in your school, which means more members in the future! During DECA ELS I learned a valuable lesson on what it takes to run a fully effective workshop. An effective workshop needs to be completely organized before it actually happens. Leave 5 minutes so that your audience can find their seats and settle down. Start off with an introduction and an energizer in order to get the attention of your audience. State your core message to make sure your audience knows exactly why they are there. These two processes mentioned in this paragraph will take a total of 5 minutes between your introduction, energizer, and core message. Then get into your first sub-topic of the workshop followed by a stimulus to get the energy back in the room and to transition into your next sub-topic and repeat the process into your third sub-topic. Each of your sub-topics and stimulus should each take 6 minutes, adding up to 18 minutes. In the middle of your second and third sub-topic you will want to create an activity that will be applicable to what your workshop is attempting to accomplish as well as get them refreshed and ready to continue processing the information you are giving them. This activity should be around 11 minutes. Lastly, conclude your workshop and reinforce the core message you are giving and answer questions anyone has. This will take about 6 minutes. In total your workshop has lasted exactly 45 minutes! With ICDC over, it is officially the start of the new DECA year! With a new DECA year that means it is time for a new DECA theme. All of Florida DECA made it count this past year. Increasing our membership to 9,041, 33 finalists (top 20) from Florida at ICDC for their competition and finally with Zack Schaja, our former Team 53 Florida DECA Vice-President and Team 54 Florida DECA President, being elected as our new International DECA President! Now that we all have made it count, it is time to understand that We Are DECA. DECA isn’t just about all of the Chartered Association Officers, or chapter officers; the most important aspect of DECA is the members. I Am DECA is a theme to remind us that we all have a voice, we all have the same passion, and we all are a key aspect of this amazing organization. I Am DECA is a statement that holds a powerful message. Most people outside of DECA see our members as one image. We are all one large diverse family with many interests. Some of us love accounting, marketing, finance, or creating new businesses. But we are all normal High School kids that took that extra step to brightening their futures. We all love the weekends, love doing things with our closest friends and family, and we all love DECA. 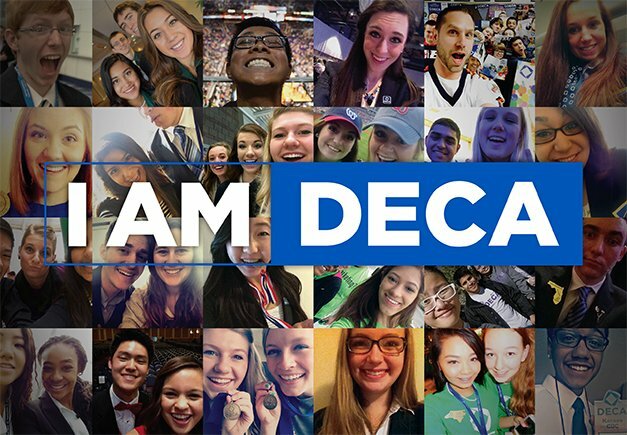 We are all what makes DECA. We need to understand that this isn’t just a statement. It is a mindset that we as a part of DECA need to have. I am proud to say that I AM DECA. We are unique, we are leaders, we are members, we are officers, we are advisors, and WE ARE DECA!